Luc Marlin, Martinican Painter and Découpage Artist: This prolific artist, whose widely-exhibited work vibrates with bold colors and cryptic designs, describes the symbols in his art, his work as a teacher, his yearly visits to the Canary Islands, and the value of Caribbean connections in our interview in his Fort-de-France studio in November, 2001. 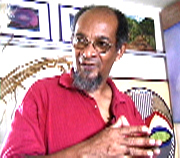 Marlin, an avid student of Caribbean history and long-time teacher of decoupage and painting to students of all ages at SERMAC, incorporates in his paintings the histories of the slave trade and of his Caribbean predecessors, found objects from daily life, and symbols based on the elements of nature. For example, he uses crosses, in the form of crossroads, to represent the points of encounter between Caribbean peoples and Europeans, the locus for the practice of magical realism, and a place where one experiences hope but also death. He often works in triads, using three stones to represent man in the first stage of evolution, the sun, moon and earth to signify the foyer created by nature, and so forth. Marlin explains his work in such detail that the viewer moves ever deeper into the pieces as well as into Caribbean reality while experiencing the beauty of his art. Video: Luc Marlin, Martinican Artist and Teacher Details: French subtitled in English and French only, both on one DVD Release date: February, 2011 Excerpt: When Aimé Césaire looked at this particular painting of mine, he said: “But Marlin, you have here the allegory of our runaway slaves, our maroons.” I think he said this because the painting includes the real sole of a shoe and also a small cavity of earth with certain objects tucked away inside the hole. The runaway slaves would escape, take off from their plantations and hide in the forest. Obviously, they would hide in stumps of trees, caves, any secret places they could find, to conceal themselves. And Césaire probably said that as well due to the kind of small tunnel you see there on the surface. Notice this. When we see that, we say it looks like tunnels made by wood lice, termites. When Césaire saw those black lines, he said to me, “but the maroons went about their work just like the termites. Little by little, they nibbled away at the system of slavery, in just the same manner.” You will observe that I don’t use much green — it is always there, but discretely. It’s not a color that I use much, I really like blues, I really like the tones of ochre, the earth tones, the colors of the volcano and of our Martinican landscape. This entry was posted on June 1, 2014 by Full Duck Productions in Ethnic Expressions and tagged Luc Marlin, Martinique.